Dalton Place is a luxury waterfront condominium building overlooking the beautiful Intracoastal Waterway and Atlantic Ocean. The 575 two- and three- bedroom condominiums are located on the West side of A1A in Highland Beach, Florida burrowed within the Boca Highlands Beach Club & Marina. Residents can choose from spacious floor plans that feature marble floors, gorgeous kitchens with granite countertops and wood cabinets, walk in closets, oversized master suites, and lard wrap around terraces perfect for taking in the tropical views. The Dalton Place condo building provides resort-style amenities to all residents. Among the amenities are its luxurious swimming pool, a top-of-the-line fitness center, illuminated tennis courts, sundeck for lounging, and the exclusive beach club. Dalton Place residents are secure inside their full service building manned by security 24 hours a day. Additional amenities include private library, media room, community room for entertaining, card room, and sauna. Residents not only have access to the luxury amenities at Dalton Place in Highland Beach they are also members of the Boca Highland Beach Club & Marina. Residents can put their feet up at the elaborate pool deck made for relaxation or feel the salt water blow through their hair at the South Palm Beach County beaches. 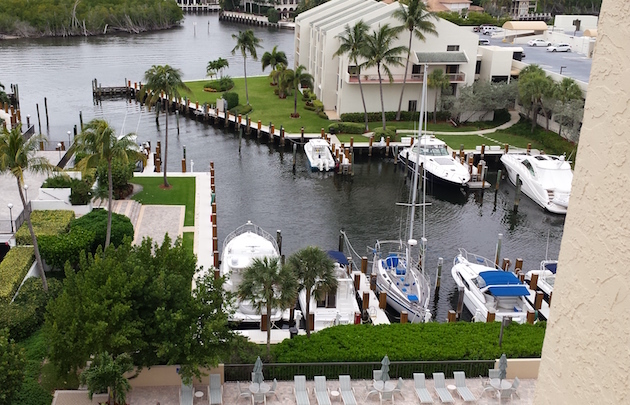 The Boca Highland Beach Club & Marina is perfect for boat owners, with a space to store your boat safely just steps away from your residence. Active residents can attend social events like Super Bowl parties, Mahjong tournaments and many more all just on the second floor of the Banquet Room that has stunning views of the ocean.